I'm re posting this project because I finally took pictures of my finished product. I love this set or baby gifts and have made several. 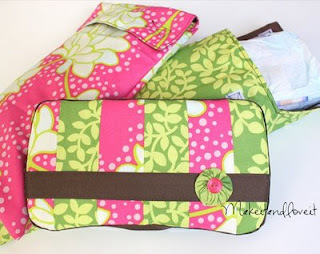 It's so much more fun to change a dirty diaper when you can see such a pretty carrying case! Here's the set I made for my sister-in-law who just had her first baby. Love it! So darling.....I love those fabrics. (I have lots of that stuff myself!) Thanks for the link and good job craftin'! !